Adjoining the Gumfreston Hotel, Rose Cottage is a quaint Victorian property that has been comfortably furnished in contemporary style with original staircase, lounge fireplace, and slate floor to the dining room. Rose Cottage also enjoys a pretty front garden. 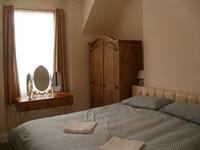 Rose Cottage sleeps up to 4 in 3 bedrooms on the first floor. The master bedroom has a double bed and flat screen TV. There is also a twin room with wash basin and smaller room with bunk beds and wash basin. A toilet is located on the landing close to each bedroom. The bathroom is on the ground floor with bath/shower over, wash basin and toilet. 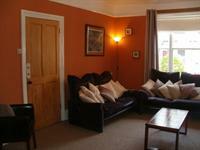 The lounge has a large flat screen TV, DVD player and IPOD docking station. The dining room has a large dining table and the kitchen has a gas range cooker, dishwasher, fridge, and microwave. There is a separate utility room with washing machine and fridge/freezer. There is a small enclosed courtyard off the kitchen and dining room with sufficient space for hanging out washing. It is not suitable for an outdoor seating area. There is a car park some 30 yards away, within sight of the cottage. Self-catering £120 per night for up to 4 people sharing, and with £20 off per night for 2 people sharing between April 3 and June 26, 2015, and between September 5 and December 15, 2015 with a Minimum 3 night stay. June 27 – August 1, 2015, weekly bookings of 2 - 4 people from Saturday to Saturday only @ £800 self-catering. August 1 - September 5, 2015, weekly bookings of 2 - 4 people from Saturday to Saturday only @ £900 self-catering. There is a 2 inch step from the pavement to the threshold of the property and then a 2 inch step over the front door into the house. The lounge has 1 step down to the dining room. There is 1 flight of stairs in the property. The property is well-lit and is centrally heated. There is a bath/showerover and toilet facilities on the ground floor. There is no step up to the bath. The ground floor kitchen has worktops with low-level range style cooker/gas hob/electric oven. There are standard width stairs (and riser approximately 7 inches) leading to the first floor.